TiHS Episode 12: Marc-André Séguin – so you want to immigrate, there’s a chatbot for that! Why IVA? Marc-André says he was interested in providing a different experience, to offer free information and make sure the information is accurate, updated, that the line of questioning would be proper and complete, and available to clients at any time. It’s an interesting time in Artificial Intelligence and chatbots. You’ve probably interacted with chatbots in your personal life. There are examples of human service nonprofits using chatbots (see below), but they are fairly few. It’s an emerging field, with lots of potential and pitfalls. My conversation with Marc-André was illuminating, both in terms of what you need to consider when creating a chatbot, and where they’re useful. This was a fun and informative conversation. I hope you find something useful in it. Where can chatbots be useful in human services? I think Marc-André put it best: “one thing that immigration law tends to lack is transparency. There are countless stories of people not being able to find the right information about what they need to come to Canada – even on government websites. Those can be very hard to navigate. Then you have private websites which may be incomplete or outdated, and would expose individuals to mistakes. Add to that a number of dishonest and sometimes fraudulent or unlicensed advisors into the mix and you find yourself with a great number of non-Canadian, vulnerable people essentially rolling the dice on how to proceed with the information they can manage to find. And Canadian immigration authorities can be quite unforgiving, even with honest mistakes. So people may be at risk of making mistakes that could cost them their plans or their future. When determining whether a website (or information) is credible or not, evaluate it on those four areas. Marc-André’s goal is to ensure that IVA continues to be clear in those areas, and useful to anyone seeking authoritative, up to date, accurate and timely information to help them make decisions about immigrating to Canada. Why IVA – an immigration chatbot? How does AI technology like chatbots fit into the immigration information process? Can you tell me a bit about the process of creating a Facebook Messenger chatbot? What resources were required, what was the process like to create it? How has it been received among potential immigrants? How many interactions has IVA had? Do you see chatbots or AI as having potential to do even more when it comes to immigration and settlement? What advice do you have for nonprofit human service providers thinking about creating a chatbot to support their work with newcomers? 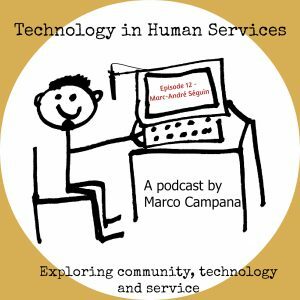 This entry was posted in Technology in Human Services Podcast. Bookmark the permalink.